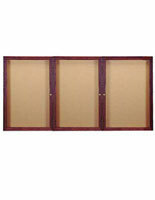 A cork board, such known as a bulletin board, is high quality at an economical price. 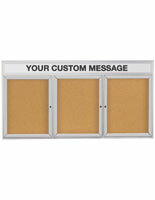 Numerous doors on this cork board enable for fast and easy notice changes. These cork boards incorporate a finely ground cork surface. Any push pins, tacks, or staples will hold firmly to the cork board's cork surface. Interior case depth is 7/8". 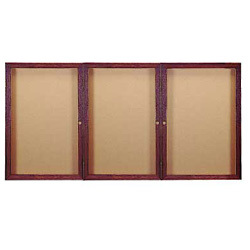 The unit is 72"w x 36"h, while its three doors are 24" wide x 36" h. This cork board is for indoor use only. Four corner mounting holes are located on the rear of the display for the mounting hardware of these option (hardware not included). Professional Installation is Needed. 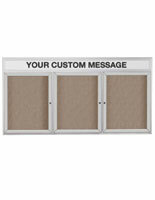 This message center, cork board is large and incorporates 3 sectors, permitting you to sort your information accordingly. 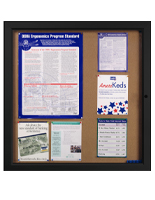 This cork board incorporates a classic and upscale design, making your information noticeable, plus enticing. 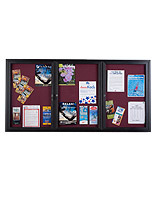 Position your cork board in any office or academic building to exhibit schedules, notes, or memos. 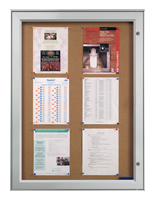 A cork board, likewise recognized known as a cork board, is perfect for hospitals, churches, government agencies, libraries and universities. 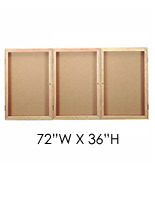 Displays2go partners with Ghent to bring you this deluxe, US produced enclosed cork board display. Ghent is a superior producer and marketer of American made visual communication products and specialty furniture, since 1976.